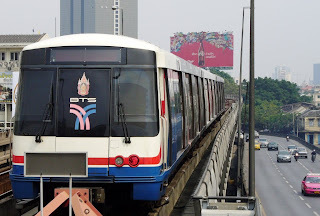 Bangkok has 2 Metro/Subway/Underground Train (or however you want to call it) systems: MRT and BTS Skytrain. MRT (Mass Rapid Transit) is the underground train or subway system. It is only 4 years old (as of 2008). 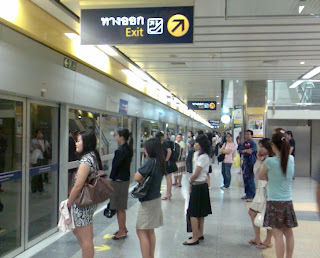 BTS or also being called SkyTrain, as the name suggests, is running above the streets of Bangkok. Both MRT and BTS are clean, convenient, and COLD! I mean seriously cold and your eye glasses gets blur when you come out from the train to the hot and steamy streets of Bangkok! I take the MRT more often just because it is more convenient for me. Let me share with you some etiquette and my experience of taking the train here in Bangkok. First of all, passengers actually queue in front of the door, especially during rush hour, while waiting for the train. The first time I took the BTS in the morning rush hour, I didn’t know. As soon as I got to the platform, I went straight to as near as I can to the train track. I was glad that I was near to the track so I could be the first one to board the train. So I just stood and waited for the train to come. I slowly looked around and felt strange that the platform was full of people but nobody was standing around or behind me. Then suddenly I saw that everyone was standing in queue while waiting for the train! I was not sure how many pairs of eyes were watching and cursing this rude guy jumping queue. I felt embarrassed but I try to stay cool. I pretended nothing happened and walked to the back of the queue and waited for my turn as everyone else did. When the train comes, people don’t push each other to get to the train. Though I can sense the ‘rush’ when train comes, but everyone just take their time to board the train. Since everyone is in queue, you just wait for your turn. If the train is full, you can have the option of standing aside and let the people behind you get on while you wait for the next train. I have never been so relaxed taking a train during rush hour because I don’t have to push or being pushed to get on the train. I think this is the Thai people’s nature of ‘sabai sabai’ (take it easy). Another important thing I noticed is that they actually allow passengers get out from the train first! I don’t see that happens in too many cities that I have been to especially in Shanghai. So, passengers in the MRT train actually don’t need to rush to the door before arrive at their destinations. There is plenty of time for passengers to get in and out of the train. While inside the MRT train, passengers like to stand facing towards the front of the train. I am very curious about it and have yet to find out the answer. Of course not 100% of them stands towards the same direction, but I would say about 95% do. And when the passengers stand, they don’t like to hold on to the stainless steel pole or the straps hung from above. So when the train moves forward, the standing passengers slightly tilted their bodies to the back to balance themselves. And tilted forward when the train brakes. I have been taking the train for 2 months, and I have never seen anyone fall down even without holding on to the pole or straps. Thai people are very polite and courteous. They carry the same manner while on the train. Sitting passengers always offer their seats to those in need, i.e. elderly or small children. The train is quite quiet here in Bangkok as most people don’t speak loudly. And when there are empty seats available, standing passengers would not rush to sit. They normally wait for a moment to see if the other passengers want to sit. 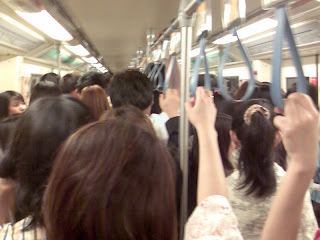 When it is crowded, passengers do stand towards in the center of the train and not gather near the doors. This let more passengers get into the train. So have you learnt something from Bangkok train systems? It amazes me that what we were taught in school like queuing and offering seats to those in need actually do happen in reality. Yes, they happen right here in Bangkok. hi friend, i feel that day by day, reading your blog, i've learned more about Thailand..... good for me! hey, 1 fine day i must visit u.
yes, u must visit me in Bangkok! I'll show u around :-) I hope to visit Dubai one day too. Emmm... Really feel ashamed that we are neighbours, but the differences are such an extreme... Maybe we should wait until 4040… 8080… But still no assurance that our people will change… Pathetic! I was in Bangkok in Apr, didn't notice that people were facing 1 direction in the MRT. I guess probably it was not during the rush hour. Here in Malaysia it still not that bad la. The Kelana Station people do queue to go into the train. You should be grateful it's not in Japan, they employ people who actually push you into the sardine pack train.